The Venetian Hotel, as the name implies, is modelled on the famous Italian city. 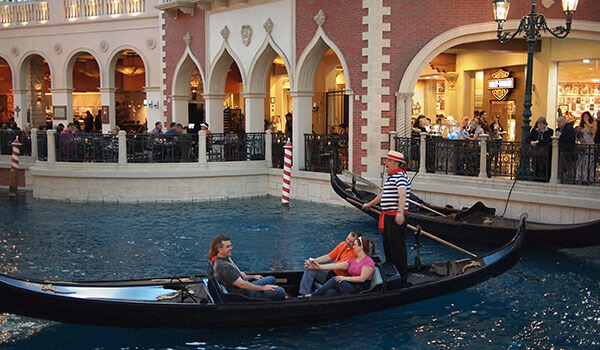 There are canals linking the different parts of the hotel, complete with gondolas and gondoliers to propel the guests along them. With nineteen different restaurants to choose from, as well as four bars, hotel guests have plenty of choice of places to eat and drink. The hotel has its own Madame Tussauds museum, with waxwork representations of famous people. There is also a specially built theatre, seating 1,700, which puts on a variety of different shows. The casino is 120,000 square foot and home to an impressive 2,500 slot machines. The Luxor takes Egypt as its theme. The hotel is comprised of an impressive pyramid, flanked by two towers and a giant sphinx. Should guests decide to leave the hotel, they can easily find it again at night, as on top of the pyramid is the world's brightest beam, a whopping 42.3 billion candlepower. For a small fee, guests can visit a replica of the tomb of King Tutankhamun. Palm trees are planted around the four outdoor pools, with canopied beds for guests to relax in. For entertainment there is an IMAX cinema or shows including acts such as Cirque du Soleil. Paris Las Vegas includes a half scale, 541-foot-tall replica of the Eiffel Tower, a sign in the shape of the Montgolfier balloon, a two-thirds size Arc de Triomphe and a replica of La Fontaine des Mers. The front of the hotel suggests the Paris Opera House and the Louvre. It's almost like visiting Paris, though transplanted into the Nevada desert and deprived of Gauloises cigarettes, the latter no doubt an upside. 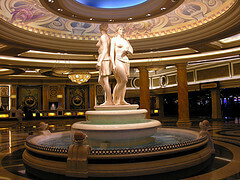 Caesars Palace is modelled on Roman times, with an emphasis on luxury and treating every guest as if they were emperors. Entertainment facilities include a recreation of the Coliseum, where major stars are regularly invited to perform and a hotel nightclub called PURE, which is reputed to be the best in the country. There is also a shopping arcade designed like a Roman town, which has 180 shops and boutiques to wander around. The casino is one of the largest at 129,000 square foot. It has all the games including every type of poker and is also the home of super megabucks jackpot. The Excalibur Hotel takes the sword of King Arthur as its theme. It is a combination of fairy tale and a recreation of medieval England. The hotel is designed as a turreted castle, surrounded by a moat complete with a drawbridge. Inside there is a medieval village, which is home to a range of shops and restaurants that include a round table buffet. The medieval theme is continued in the entertainment, which includes a court jester's performance stage, jousting and a fantasy "fayre" for children. Treasure Island was opened by Mirage Resorts in 1993 under the direction of Steve Wynn at a cost of $450 million. It was designed by architect Joel Bergman. Outside the hotel, there's a pirate ship and a jungle. In keeping with the maritime theme of Treasure Island, the main bar is named the "Galleon". The initial plans called for a tower addition to The Mirage, but later evolved into a full-fledged separate hotel casino resort. Circus Circus is, as the name implies, modelled on a circus. It has the world's largest, permanent big top where traditional circus acts such as high wire and trapeze acts are put on for guests. The hotel also has a theme park where guests can choose from twenty-five different rides ranging from a carousel to a roller coaster. The circus acts and the theme park make it a popular hotel with families. The hotel has a number of different places to eat including the largest buffet in the world. Sports facilities include a large swimming pool and gym. All the hotels have casinos with a full array of games, so the choice depends on personal taste, whether you would like to be in Venice, Egypt or a recreation of another era. Post by Tony, on behalf of CheapFlights, where you can find flights to USA online. Photos by rickpilot_2000 (1), larrylobster (2), and Thom Watson (3). Last updated by jack on 31 March, 2014 in Lodging.